Rub the rim of a martini glass with the lime wedge. Put the sugar in a saucer and dip in the rim of the glass. Blend the other ingredients with a handful of ice for 40 seconds until smooth. 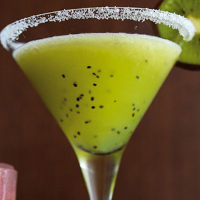 Pour into the glass and garnish with a slice of kiwi.